Stuffed peppers experiment: not the cooking part, just the recipe posting part – Own Less. Do More. Bear with me while I learn a new trick? Your reward will be this slow cooker recipe I like, in an easy-to-print format that my prior food blogging efforts lacked. See the cute little “print” button under the photo? Click that. This recipe also happens to be perfect for cool autumn weather, and it’s fairly adaptable to various types of -free diets. I had to use a recipe I already had a photo for, because I didn’t want to cook a thing and document every step and learn how to post it all at one go, so you get an oldie. I first served this dish in 2011, and I’d happily give credit to its original publisher if I remembered where I’d found it in the first place, so if it’s yours, speak up! Hearty, savory, warm, filling, and very, very, juicy. I highly recommend serving these in bowls instead of on plates! In a 6-quart slow cooker, combine the tomato sauce, oregano and pepper. Wash peppers and pat dry. If they do not sit upright, slice a very thin piece off the bottom. Finely chop the pieces and place in large bowl. Add the onion, potato, parsley and crushed red pepper to the bowl, and toss to combine. Add the sausage and mix to incorporate. Using a paring knife at a slight angle, cut the tops off the peppers; discard the seeds. Spoon the sausage mixture (about 1 cup each) into the peppers. 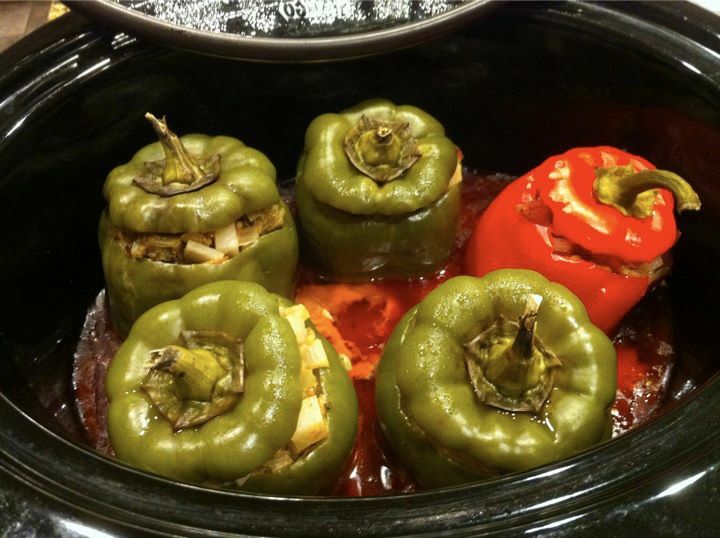 Arrange the peppers upright in the slow cooker and place the tops over the filling. Cover and cook until the sausage is cooked through and the peppers are tender, 5-6 hours on low or 3-4 hours on high. Using two large spoons, transfer the peppers to serving dish, letting any excess liquid drain into the sauce first. Stir the sauce and serve with peppers. There’s one standout in every crowd? More likely I just used what I had on hand at the time. Here are links to other recipes I’ve posted. I will probably not go back and reformat them, even though there aren’t that many, because I’m just not that ambitious, and I have no designs on becoming a Food Blogger (capitalization intentional). But I’ll post future recipes in the format above, for ease of both viewing and printing. You can also find my recipes by going to my “Categories” drop-down bar and selecting “RECIPES.” This feature appears on the left or near the bottom of any page, depending on what type of device you’re using. Yes, I use my slow cooker a lot. No, I have not upgraded to an Instant Pot. Love the format. How did you do that? It’s a plug-in for WordPress called Recipe Maker. Very easy to install and get started! I went with the free, no-frills version since I post only an occasional recipe. There is a premium version available for a fee, for those who are more serious food bloggers. Good luck! I’ve made these twice and they are wonderful. Great idea to use the Italian Sausage – it adds so much more flavor then plain ground beef. I did make a slight change to the recipe by substituting chopped fresh mushrooms for the potato. You have ended the Stuffed Bell Peppers war at our house. My husband loved his mother’s stuffed bell peppers – she used rice – which I hate, so I just didn’t make them often (read never). I decided to try these, Emily, when I saw the ingredient list (short and no rice). He loves (!!!) these. Thank you. After 47 years of marriage I can add Stuffed Bell Peppers to the dinner rotation. You’ve made my day! Thank you, Sharon. I’m so glad they are a hit! And next time, I’ll try throwing in some mushrooms too. That sounds delicious!